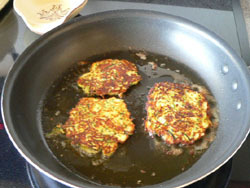 I love to serve Zucchini Hash browns for breakfast. I make up a batch ahead of time and just warm in the microwave as needed. Nice breakfast food for on the go. If you have a garden and have planted zucchini you know how abundant they are in the late summer. I shred and bag 2 cup size portions and freeze. 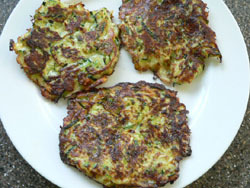 So nice to have on hand throughout the year for making your favorite zucchini dishes. Directions: Mix zucchini with salt. Let stand 30 minutes. Squeeze or press to get out moisture. Mix together all remaining ingredients. Heat oil in skillet. Drop by spoonfuls (about 1/4 to a 1/2 cup) into hot skillet, flatten to about a baseball size. After browning on one side flip and brown the other side. Place on paper towel to absorb oil. 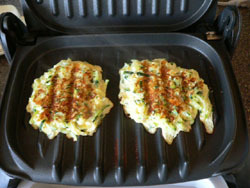 Try using a George Foreman Grill in 1/2 cup portions. Cook for about 5-7 minutes or until golden brown. Eliminates the oil. Another suggestion to make it Lite, substitute the whole egg with with egg whites to lower calorie, cholesterol, and fat counts. Egg beaters work as a great substitute.